Any tax increases today simply accommodates the recent massive, misguided and destructive expansion of government. Thank you, Eric Cantor. Thank you for walking out on useless talks, presided over by Vice President Biden, addressing raising the limit on our nation's debt. This, I am sure, is true. But we also must understand the deeper and broader issue. We are in nothing less than hand-to-hand combat, fighting for what America is about and what it takes to get this country back on track of growth and prosperity. Whether we are, most fundamentally, a welfare state in which government runs the show, or whether this is a free country, in which free, private citizens run the show. President Barack Obama assumed the presidency in January 2009, and, until this year, Democrats have controlled Congress. Under their leadership, we've had massive government expansion and intervention into our economy in the name of saving it. The federal budget has grown by a trillion dollars, an expansion by one third. Federal spending, historically 18 percent of our economy is now 25 percent. Now, 30 months later, the lowest unemployment rate that America has known since Barack Obama has been president was the 7.8 percent where it stood in the first month when he assumed office. What should trouble every American is that there is not a hint from the White House or from Democratic leaders that they have erred and have taken our nation down the wrong path. There is not a hint that they have even considered that their ideas and approach are wrong. We are facing many dangers. And one of them is that Americans get used to the way things are. Unemployment currently stands at 9.1 percent. It has hovered between 9 and 10 percent for almost the entire Obama presidency. From this perspective, we almost long for the 7.8 percent where it stood in January 2009. As this drags on, memories will fade that when the American economy is moving full tilt, unemployment is around five percent. Let's also recall that back in January 2009 there were dissenting voices. In that same month, the Cato Institute ran full-page newspaper ads challenging the statement of our new president that "There is no disagreement that we need action by our government, a recovery plan that will help jumpstart the economy." The ad says "With all due respect Mr. President, that is not true." The ad is signed by hundreds of economists, including several Nobel Prize winners. I wrote a column in February 2009 in response to which I'm still getting letters. I wrote then: "I thought we were on the road to moving socialism out of poor black communities and replacing it with wealth producing American capitalism. But, incredibly, we are going in the opposite direction. Instead of poor American on socialism becoming more like rich America on capitalism, rich America on capitalism is becoming more like poor American on socialism." 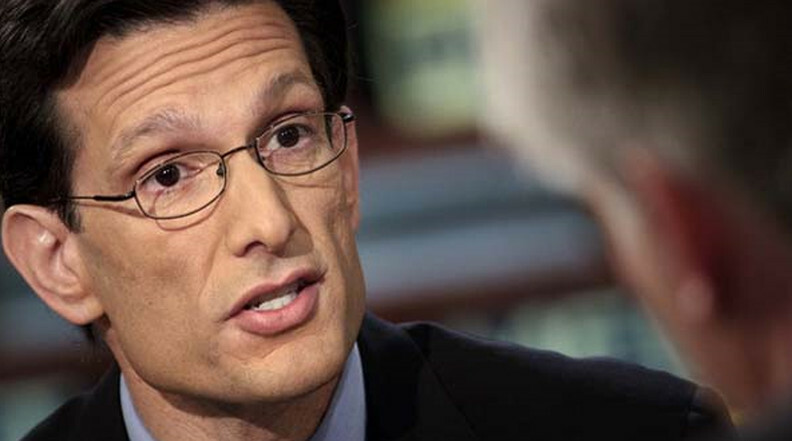 Keep it up Mr. Cantor.